But oh my dear, I am tired of being Alice in Wonderland. Does it sound ungrateful? It is. Only I do get tired. Only I do get tired. I pause, place the pen down next to the page, and massage my aching hand; the joints of my fingers, in particular, are stiff and cold and ugly, like knots on a tree. One does get tired of so many things, of course, when one is eighty, not the least of which is answering endless letters. However, I cannot say that, not to my own son. Although I'm not entirely sure what I am trying to say in this letter to Caryl, so kindly inquiring as to my health after our hectic journey. He accompanied me to America, naturally; if I'm being completely truthful, I would have to admit my son was much more excited about the prospect of escorting Alice in Wonderland across the ocean than Alice herself was in going. "But Mamma," he said in that coy way—entirely ridiculous for a man of his age, and I told him so. "We—you—owe it to the public. All this interest in Lewis Carroll, simply because it's the centennial of his birth, and everyone wants to meet the real Alice. An honorary doctorate from Columbia University." He consulted the telegram in his hand. "Interviews on the radio. You simply must go. You'll have a marvelous time." No, I will not. That is uncharitable to Caryl and painful to myself. Surprisingly, when the time came I did have a marvelous time. So much fuss made over me! Bands playing when the ship docked, banners everywhere, even confetti; endless photographs of me drinking tea—so tedious, but the Americans simply could not get enough of that. Alice in Wonderland at a tea party! Imagine! It was a miracle they didn't ask Caryl to dress up as the Mad Hatter. However, to be feted by scholars—it took me back, in such an unexpected way, to my childhood, to Oxford. I hadn't realized how much I'd missed the stimulating atmosphere of academia, the pomp and circumstance, the endless arguments that no one could win, which was never the point; the point was purely the love of discourse, the heat of the battle. Shockingly—and despite what I had been warned—I found everyone in America to be perfectly charming, with the exception of one unfortunate youth who offered me a stick of something called "chewing gum," just prior to the ceremony at Columbia. "What does one do with it?" I inquired, only to be told, simply, to chew. "Chew? Without swallowing?" "To what end? What possibly could be the point?" The young man could not answer that, and withdrew his invitation with a sheepish smile. Still, what was truly tiresome—what is always truly tiresome— was the disappointment, brief and politely suppressed, evident in all the faces. The disappointment of looking for a little girl, a bright little girl in a starched white pinafore, and finding an old lady instead. I understand. I myself suffer it each time I consult a looking glass, only to wonder how the glass can be so cracked and muddled—and then realize, with a pang of despair, that it is not the glass that is deficient, after all. It is not merely vanity, although I admit I have more than my fair share of this conceit. Other elderly dowagers, however, were not immortalized in print as a little girl, and not merely as a little girl but rather as the embodiment of Childhood itself. So they are not confronted by people who ask, always so very eagerly, to see "the real Alice"—and who cannot hide the shock, the disbelief, that the real Alice has not been able to stop time. So yes, I do get tired. Of pretending; of remembering who I am, and who I am not, and if I sometimes get the two confused— much like the Alice in the story—I may be excused. For I am eighty. I am also tired of being asked "Why?" Why did I sell the manuscript, the original version of Alice's Adventures in Wonderland, printed by Mr. Dodgson just for me? Why would the muse part with the evidence of the artist's devotion? Even Americans, with their eagerness to put a price on everything, could not understand. I look out the windows—the heavy leaded glass windows, not as sparkling as I would wish; I'll have to speak to Mary Ann about that—of my sitting room, which overlooks the lush, heavily forested grounds of Cuffnells. Today the clouds are low, so the tempting glitter of the Solent is hidden from view. I can see the lawn where the boys played, Alan and Rex (and yes, Caryl); the pitch where they played cricket; the paths where they first learned to ride and where they strode home with their first stag, accompanied by their father, so very proud—and I know I made the only decision possible. This place, this is my sons' childhood, their heritage, and it's all I have left. The other, the simply bound manuscript posted to me one cold November morning, long after the golden afternoon of its creation—that was my childhood. Only it had never truly belonged to me; Mr. Dodgson, of all people, understood that. The clock on the mantel chimes twice; how long have I been sitting here staring out the window? The ink on the nib of my pen has dried. I find myself doing such idle, silly things so often these days, these days when my thoughts scatter like billiard balls into their respective pockets, these days when I am so very tired, unaccountably weary; I even find myself dozing off at the oddest moments, such as teatime, or late mornings when I should be going over accounts. Simply contemplating my eternal weariness provokes a yawn, and I look longingly at the chaise in the corner, with its faded red afghan thrown over the arm. I manage to stifle the yawn and tell myself sternly that it is only two o'clock, and there is much to do. I fold the letter to Caryl neatly in thirds; I'll finish it later. I open my desk drawer and remove a stack of letters bound with a worn black silk ribbon, letters that I have begun and not finished, for various reasons. I have learned, through the years, it is the letter not sent that is often the most valuable. I received your kind letter of Tuesday last—And that is all I have managed to write. Ina's kind letter of Tuesday last also is within this bundle; I remove it, adjust my spectacles (really, the indignities of age are most trying), and peruse it once more. This is the letter that I long to answer, not the one from Caryl kindly inquiring as to my health. No, this letter, this ghost missive from my sister, dear Ina, dead now two years, almost. Yet the muddled memories she stirred up—the memories she always managed to stir up, or manufacture, as if she were a conjurer or a witch instead of a perfect Victorian lady—will not die with her. Will they die with Alice? I often wonder. Before I am gone from this earth, before my bones lie in the churchyard, so far away from where those other bones lie, I do hope that others' memories will finally fall away and I will be able to remember,with a clarity of my very own, what happened that afternoon. That seemingly lovely summer afternoon, when between the two of us, we set out to destroy Wonderland—my Wonderland, his Wonderland—forever. So yes, I do get tired; tired of pretending to be Alice in Wonderland still, always. Although it has been no easier being Alice Pleasance Hargreaves. Truly, I wonder; I have always wondered—Which is the real Alice, and which the pretend? Oh dear! I'm sounding like one of Mr. Dodgson's nonsense poems now. He was so very clever at that sort of thing; much cleverer than I, who never had the patience, not then, not now. I remove my spectacles; massage the bridge of my nose where they pinch. My head is throbbing, threatening, and I do not like being in this state. The journey was exhausting, if I'm being entirely truthful. I am tired of being Alice, period; yet my memories will not let me rest, not as long as I'm reading through old letters, which is the surest sign yet that I have become a doddering old fool. The chaise looks so inviting; it's such a cold afternoon. Perhaps I will lie down, after all. Off with their—legs. that was the curious notion I had as a child. That certain people—queens, generally—lost their heads was understood to be a historical fact. But in my world, legs were missing with alarming regularity as well. The men in their long academic robes, the women in their voluminous skirts; everyone skimming, floating, like puffs of cotton in the air—that is the first, and most vivid, memory of my childhood. I knew, of course, that children possessed legs; yet the legs seemed to disappear as their owners grew up, and if I never questioned the logic of this it must be because, even then, I understood that Oxford was a kingdom unto itself. It was different from, and superior to, the rest of the globe (which of course meant Britain, for those were the years when the sun never set on Victoria's empire), complete with its own rules, language, and even time; all the clocks in Oxford were set five minutes ahead of Greenwich Mean Time. Naturally, it follows that if Oxford was its own kingdom, then I was its princess—one of three, to be precise—because my mother was, as everyone knew, its queen. Remarkable for a woman who bore ten children—one would have assumed she was perpetually in a state of bearing a child, or waiting for a child, or getting over a child—Mamma made certain that the Deanery was the social center of Christ Church, which was of course the social center of Oxford. No one dared give a party or a bazaar or a dance without her approval. At times she even graciously made room for other queens; Victoria herself once stayed with us, although not even her plump, imperious personage intimidated Mamma. Papa was merely the Dean of Christ Church, responsible for the education and religious upbringing of hundreds of gentlemen, including the sons of that same queen. Even when I was so young that the only place I could look was up, for I was all too well acquainted with the ground, I knew that he was quite important. I am the Dean, and this is Mrs. Liddell She plays the first, and I the second fiddle. This did not reach my ears, however, until much later. For as the daughter of the Dean and Mrs. Liddell, I was sheltered, at least for a time, from most of the gossip that was the chief occupation of some of the finest scholarly minds of the age. Privileged was how I would describe my early years, if only because I was told that they were such. I knew no life before Oxford, although Papa was, even then, a rising academic; domestic chaplain to Prince Albert, headmaster of the Westminster School in London. I was baptized in the Abbey, the fourth child, second daughter. I don't recall that Mamma ever spoke of it one way or another. Although surely that can't be true. When I was scarcely four—in 1856—we arrived in Oxford, upon Papa's appointment as Dean of Christ Church. By then the family included Harry, the eldest; followed by Lorina, myself, and Edith—the three princesses. Ina was three years older than I, Edith two years younger. All of us—along with servants, fine china, heirloom silver, imported linens, and all the other necessities of a distinguished household—moved into the Deanery, which Papa had arranged to be enlarged and remodeled to accommodate our growing family. Even so, it was never quite large enough for Mamma's ambitions. It was in this world, this Oxford, that my first memories were made. It was a peculiar world for a little girl, in many ways; there were few children my age, as all the students and dons at the time were supposed to be celibate. Only the deans, the senior members of the college, were allowed to marry, and most of them were of an age where children weren't possible. Papa was rather the exception to the rule, and I believe that he was proud of the fact. Perhaps that was why there were so many of us. Each night, after I was snug in bed, Old Tom, the bell in the imposing tower that was the centerpiece of Christ Church, tolled one hundred and one times (signifying the original number of students at the college); even as I struggled to remain awake for the first chime, I rarely made it all the way through to the end. Our home, the Deanery, was opposite the tower, our front entrance part of the pale stone fortress of buildings bordering the flat green Quad; we also had a private entrance opening up to the back garden. Quite literally, we lived among the students; I remember walking with Ina and Edith—three little maids all in a row, always dressed exactly alike, crisp white frocks in summer, rich velvets in winter—in the Quad with our governess, Miss Prickett, as young men removed their caps and bowed low, exaggeratedly, at our approach. 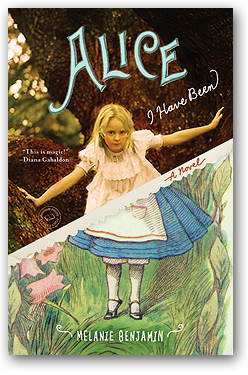 Excerpted from Alice I Have Been by Melanie Benjamin Copyright © 2010 by Melanie Benjamin. Excerpted by permission of Delacorte, a division of Random House, Inc. All rights reserved. No part of this excerpt may be reproduced or reprinted without permission in writing from the publisher.